There is nothing – absolutely nothing – more humbling than a really close encounter with a whale. When they look straight at you from very close range, you feel your soul stripped bare somehow; their gaze is enough to capture and dominate, and to show us what is really important in life. But when they go so far as to seek out the human touch, THAT is a life-changing experience more powerful than any drug and more emotional than any work of art. I have been to Baja in Mexico several times now to experience the world of the grey whale and to get yet another dose of that emotional high that I find so difficult to explain. Giants of the sea, the grey whale can reach almost 15 metres in length and weigh up to 36 tonnes. Awesome. On this particular day we were once again out on San Ignacio Lagoon in a 4 metre “tinnie”, only a short distance from shore, when several whale mothers began to swim towards and around us. They are curious creatures and behave in the most unheard-of fashion by each bringing their young calves with them to meet and play with us. One mum and one calf at a time. Any hesitant youngsters are propelled towards us by their mothers who get underneath their calf and prop them up as they make their way over to us to say hello. Our calling and cheering only serve to attract them more – it’s play time! We had been playing with and fondling several mothers and calves, basking in the joyous atmosphere and being playfully splashed by the whales, our tiny boat rocking precariously underneath us, when one whale mum purposefully pushed her baby up and out of the water, almost into the boat, to show it off – or so it seemed. The next thing we knew was that the little one had lifted its head right out of the water under our outreached hands and opened its mouth wide in the biggest smile ever seen. It buoyed itself up for ages, pushing its smiling mouth into our hands and moving its head back and forth for us to stroke its pink baleen and upstretched tongue while mum looked on proudly. You could almost hear the blissful sighs from baby. Hopefully the image here gives an indication of just how special and privileged such an interaction is. Rarely does one ever see such a raw display of trust and fun in any arena, let alone with creatures whose main experience of man has been anything but positive. 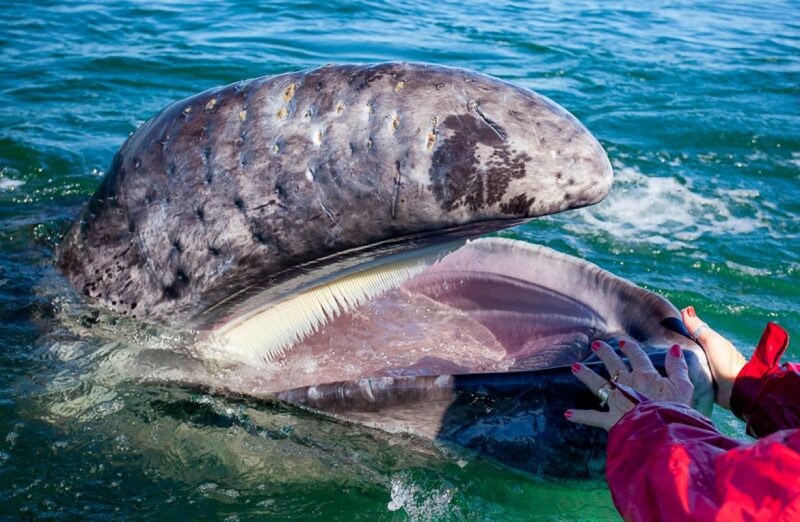 That baby grey whale and its mother personified respect, forgiveness and magic. I need to get back to Baja.